This is my first attempt at a gingerbread house ever. I got this template from a book that one of the chefs at school let me borrow. The barn's "wooden planks" are actually Big Red chewing gum! 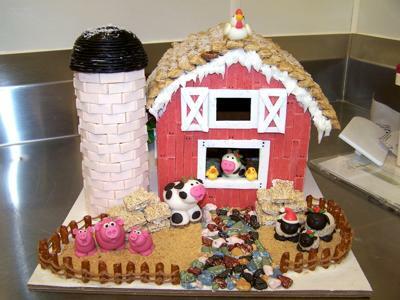 I am planning on making a gingerbread barn this year but when I looked at The Big Red chewing gum, it was very pale how did you get yours so red? What do you use to cover the silo? What other candy is used? OMG!!!! This barn is AMAZING!!!! I LOVE it!!!! This barn is the greatest. Very creative. I've never seen a barn, (we don't have them here) but this one is wonderful! Good job! please scan the template and add it to the page.